How come that in none of our religious books is mentioned that next to The Crucifixion of Jesus another Crucifixion took place? 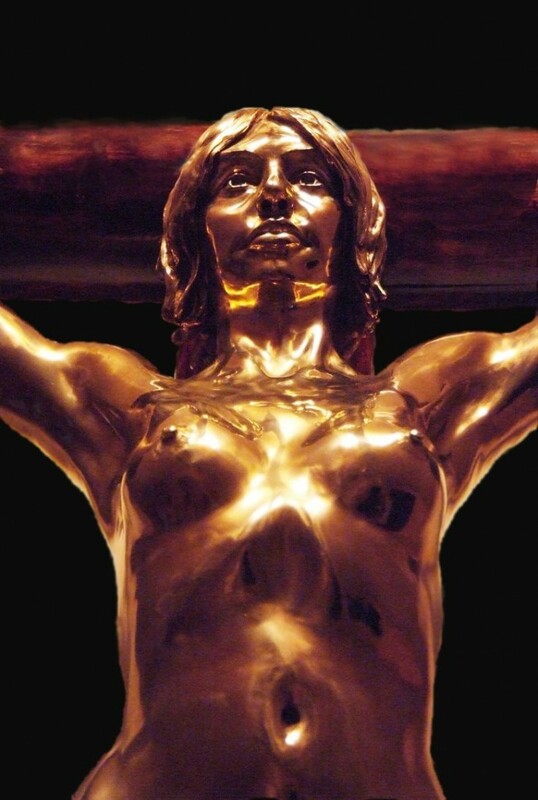 The Secret Crucifixion of Mary Magdalena. You got to ask yourself this question,especially now that Easter is here.Once again i do not mean to break your holidays,Truth has to come out.It Is Big Time.And another Truth too:with every little drop of alcohol,name it beer or wine you are lowering your vibration for a week.Yes,i know there are many out there to send me flames of hate and before you do that,i ask you to look a deep look into yourself and see what is that you are doing to yourself every time you are sending hate to somebody.Cause your hate doesn’t affect me at all.It only affects you and your reality.One example?Look at what happened in Paris and what happened now in Brussels.It is the collective hate that has attracted this kind of events believe it or not.The truth is difficult to swallow but the time has come to bring out there All Truth as we are called to leave in higher dimension of living where unconditional love is the rule,where all men,women and children live truly happy.This goes also from the financial abundance of everyone,even if most will say that money is not important.It is important cause this is the way towards true freedom where money will not be necessary any longer.So please,once again,especially Belgium where i have the most friends through this profile,i ask you with so much love and invite you to look inside you,to take the time to connect with your higher self in prayer and meditation and ask for your peace and worldwide peace.Ask and it is given!The Angels have confirmed me that all victims of Brussels are now living happy in another dimension at The Pleiades along with other 70 billion other souls that got released from their Astral attachments.That was the message of our brother Jesus.Resurrection of every living being is possible.I am talking about your Resurrection in this reality and The Resurrection of all other souls in another reality.We are all part of God,God is immortal,We are Immortal,let fear leave your building by being grateful for what you have and rejoice for what is coming with the re evaluation of currencies that will help bring our realities towards unimaginable dimensions of existence.Prosperity and Abundance is a state of mind.It is all here for you now if you choose to attract this to you by being in high vibrations in the core of your being by feeling good!And not just feeling good but FEEL MORE THAN FINE everybody FEEL MORE THAN FINEl In The Core of Your Being to Raise Your Vibration to Manifest Heaven On Earth. You are in an intense energetic shift now. Mother and Father God are sending their Light and Love coursing across the planet. Sometimes you feel it as an ecstatic moment of bliss, and other times you experience it as overwhelming, or even upsetting, because you are going through so much change, so quickly. It can feel like a roller coaster ride or a fast elevator ride, disorienting, strange, like the first time you try 3-D glasses in a movie theatre. Many of you, the Transmuters and Lightbearers like our Christine and Kathryn and their teams, are feeling exhausted beyond anything they have ever felt before. Many are physically ill because of the enormous amounts of toxic energies they (you!) are processing with your bodies. You are living transformers, drawing in an enormous amount of Light while simultaneously discharging a constant release of transformed energy. Beloved Ones, it may seem so strange to you to realize how literal these things can be, but it is true that a certain amount of Earth’s negative energies must be cleared in order for you to raise the vibration of the planet as a whole. It is just the Universal Law that holds for all planets. The difference here is that you are doing it in such a compressed time frame. It is extremely fast for a planet in such a dark and toxic state, yet you are working hard now, with many more joining the “clean-up crew,” by the hour! Things are moving along so dramatically; it is truly thrilling. I will describe to you some of what we know and what we see. The awakening that is happening is Earth-shaking, in the sense that it is affecting every single being on the Earth – animal, vegetable, mineral and human. You are all feeling and responding to the rising energies of Light, and it is having a disruptive effect on everyone. Now, what will that effect produce in you? Will it disrupt old patterns of thinking? Yes, absolutely, that is the goal. In this interim phase of transformation, what you do with the “unhinged” feeling is crucial to your own trajectory and to the amount of assistance you are able to offer the planet. Some who are still engaged in fear on a deep level will feel the disruption as threatening. They will revert with all their might to ideology – the ideas they think to be right and true because of their past history, training and programming. There will be a brief time while the pontificators, the talking heads and the self-righteous promoters peddle their opinions. This is happening now. Judgmental criticisms – even those sugar-coated with syrupy explanations of good intentions and loving offerings – are filling the airwaves. There is a rather easy way to identify the fraudsters who are really just trying to hang on to their egos a bit longer. They always say something that sounds like, “I just want to warn you, because I love you (have your best interest at heart, etc. ), and they always present themselves as the expert, or the one whose source is the expert, yet their messages always make you feel a little fearful, or a little wary about someone they are alternately flattering and degrading. There is always a manipulative twist in their message that will make you doubt someone other than them. You are now being treated to the greatest Shakespearian drama Earth has ever seen, and you have front row seats! Look through the eyes of laughter at the characters who now fill the public stage with their buffoonery. Is it not a kind of brilliance to see a caricature of everything that is abominable in the human story being revealed for all to see? The extremes of ideology and belief systems are being exposed as the comedy they really are; the unreal and unreasonable prejudices and hatefulness are being laid bare before your eyes. Will you use these absurdities and atrocities to stir outrage within you? Or will you see through the thinly disguised parodies as a way through, from the 3-dimensional trap of being enslaved by ideas, to a new freedom that only can be accessed in your heart? Are you one of the bravest of the brave who will dare to ask and search within: where do these tendencies still reside within me? The Truth is far deeper than what meets the eye, or strikes a chord of fear in your nervous system. We are headed for a new higher dimensional experience, Beloved Brothers and Sisters, and where we are going there is no place for anxiety, worry, fear, obsessive analysis, reduction, or argument. When we expand, beyond the boundaries of our past experience, beyond the sensations we are used to having, beyond the ideas we are used to thinking and the brain pathways we are used to following, what we find is a new and brilliant life where companionship, love and trust are the new bottom line. We are stretching the boundaries of possibility, my fellow travelers. We are here to create a miracle, and we are seeing the flashes of brilliance already before us. Our fellow humans are forging new pathways of cooperation, and they are building the bridges that will make our new Earth a place of friendship, easy collaboration, teamwork and joyful sharing. No one will be left out or left behind. No one will be left to suffer or to bear a burden that is beyond their strength to bear alone. There will be no anxiety or depression or “stress” because no being will be heartlessly pushed beyond their endurance. This applies to animals and plant life as well. Our dear planet will no longer be allowed to suffer the insults of toxic chemicals, genetically modified abominations, explosives, and other dark inventions that have poisoned all Earth’s beings. Freedom means freedom from suffering, Beloveds! Freedom for absolutely everyone! You can hear the old echoes in your thinking, can you not? I included every blade of grass in my descriptions of love and freedom because how many of you would have automatically thought, “Yes, but what about…(the orphans, or the animals, or the whales, or the chemtrails…).” Dear humankind, I am here to tell you that Mother and Father God do not forget any of their children, or any of their children’s conscious creations. God created the concept, “ecosystem.” We are all in this together, and we are all going to walk joyfully into the Light of our new day together. It has been difficult for many to understand how revaluing the world’s currencies could heal our planet. Of course, if you are knowledgeable about the slavery that money created, you are right to be wary of anything that professes to be monetary reform. It is not that. The RV, as we call it, is a step toward eliminating the need for money altogether. First, we must have such economic abundance that people can acclimate to the reality that there is truly no need to worry, about anything. This is a more difficult challenge than you may realize. Just look deeply into your own wary reactions, and multiply that by 7.5 billion. I am Sananda, the one you knew as Jesus, and I understand economics, as much as I understand the need for a human family to be able to have food and shelter. I understand Love, and I know that “politics” and devious economic policies can interfere with a family’s ability to be well fed and safely housed. How can any family be happy and free when they are in fear for their survival? I know that debt slavery has suppressed the creativity and intellectual freedom of all humankind, and I am here to show you that my heart and soul are with you as you free yourselves from all the external chains and inner constraints that suffocated you in the past. Once all can agree to leave behind the ingrained caution and fear of change, then we can begin to see everyone blossom and expand into the brilliant, creative beings they were born to be. Everyone. No exceptions. You were born in God’s image. It is your birthright to be brilliant and happy. This adventure into 3 dimensional reality will prove to be just a stepping stone to further creativity. I have spoken to you in recent messages, as has Father God, about the profound effect of every individual on the progress of our Ascension. It has been difficult for some to hear of their own responsibility to manage their own feelings and thoughts without feeling they are being blamed for the slow rollout of the Prosperity Programs. I will repeat many times: You are Loved, and we know how hard it is to be there and to shake off the terrible guilt programming the cabal has saddled everyone with. Do not fall into self-blame and the resentment it generates! You are not to blame; you are simply an important member of a very important team. We count on you. The team must work together in harmony to create the high vibrational portal through which all can ascend into a new reality. You, and everyone, can help or hinder, as you choose. We only ask that you take responsibility for the fact that you are choosing and for the results of your choices. This is true freedom. There is a popular sci-fi theme that goes something like this: A group of adventurers is searching for long-hidden treasure. Each one holds a part of the key that will lead to the treasure, but they don’t really understand what it is they are holding. These keys have a particular energy signature, a color, a vibration that will unlock the great door that has hidden from view the passageway to great abundance. It requires many focusing their high vibrational energy together to open the door. Those who send the energies of negativity, doubt and fear create obstacles to the flow of Light, blocking others and slowing the group’s progress toward abundance, but they will not be successful, because the Lightbearers are doing God’s work, with the blessing of the entire Company of Heaven and under the protective watch of the Galactic Federation of Light. What I am describing is a fairly simple law of physics, which we call Universal Law, but one that – although you are deeply familiar with – you have only slight recollection of because it has not been discussed openly in the mainstream by your scientists or leaders. Many are aware of it, but do not talk about it for fear of being attacked or discredited by those very negativity-producers who wish to stop the adventure for their own ego comfort or profit. It is the Universal Law of Creation: What you think about and focus your emotional energy on, you create. It is sometimes said, “What you imagine, you create.” Now, this does not mean you cannot look at negativity or darkness and try to change it. You are not tainted by something you look at or think about unless you believe it, unless you invest your thoughts and life-force in it. We must see a problem in order to bring Love to dissolve it. In that way, you are consciously creating the glory you hold as your guiding inner vision: Freedom for all! Hold your Light high, Beloved Warriors of the Light. This is not a battle; it is a triumphal march, accompanied by the Heavenly orchestra. You who are reading this are among the human adventurers who are leading the charge, creating the pathways for others to follow. You are succeeding brilliantly, in spite of the rip-tide of negative energy you are moving through. You hold to each other, moving now as One, in a great wave of joyful, harmonious energy. You are forging the Rainbow Bridge out of the 3rd dimension, across the 4th and victoriously toward us in the 5th and higher dimensions. Carry on, Brave Ones, you are creating at the edge of Creation! Let me describe to you the specifics of how we are working together. You have heard the expression that Earth is the battleground between Light and Dark, good and evil. What you have not completely understood in the past is that it will not take the form of a war. You are succeeding by leaving all war, suffering and negativity behind. In the higher dimensions, we are reaching toward you, working with our Boots on the Ground to shore up your gains and use them to further clear the way for you. Here is how we are doing it: As you work on Earth’s surface to clear the energy field of dark thoughtforms, and as you, by example, teach your fellow humans about the Universal Law of Creation, you are helping to stop the constant influx of negativity, thereby raising the vibration of the collective. You are working from the bottom up, you might say, as we are working from the top down. This is succeeding, as we bring forth programs that are revealing numerous machinations and devious ploys, making it possible to remove the perpetrators – the cabal leaders – thereby eliminating the hierarchy of those who controlled the Matrix programs. They have surrendered one by one or in groups, either by coming to the Temple of Light to ask for healing and mercy, or by being arrested and removed from power. They have a choice either way, as all do. They are no longer able to develop new programs or force their minions to carry out abominations in the name of controlling humanity. Like everyone, the minions are now left to make their own choices. Meanwhile, you, the Troops on the Ground, are raising yourselves and others by your example of steadfast and loving attention to your own growth. You have created a groundswell of consciousness that is changing what has been called the zeitgeist. (“The defining spirit or mood of a particular period of history as shown by the ideas and beliefs of the time.” – Word dictionary.) You are making it harder and harder for the minions – the so-called Wannabe dark hats – to carry out their previously laid nefarious plans to defeat the Light and hold back freedom for all because their fear tactics no longer carry the assumed weight of truth. The brighter your Light, the more you reveal their antics to be nothing but hot air. I speak to you now as Jesus. We are moving, step by step, to meet in the place where all is revealed in the Light of Mother and Father God’s Love. So now, before I close this message, I would like address what you might call religious freedom. You recognize my loving energy and my service to humankind as a savior and a martyr, but truly, I am both, and I am neither, just the same as you. I am a child of God, just as you are. In my incarnation as Jesus, I fulfilled a mission I had agreed to before I came to Earth. We all knew it would be difficult, and preparations were made to allow me the greatest support possible. I was never alone. Our goal was to teach of God’s love and to offer, through my Resurrection, an example for humankind to show that Ascension is possible. I was not God’s only begotten son – we are all sons and daughters of Mother and Father God. There are some, out of Love for me and a wish to honor my service, who call me Lord Jesus, or Lord Sananda. I am a servant of God, as we all are, and even God does not wish to be worshipped or placed in a position of superiority because superiority and power can too easily imply subservience. You and I are not lesser or greater than each other. We are all equal in God’s eyes. Of course we acknowledge Mother and Father’s great Love and their enormous capacity to create. We bow to them out of Love, to honor their kindness and their great Heart, but they would rather see us dance and sing than prostrate ourselves before them. They do not wish to be worshipped by demonstrations of our belief that we are inferior to them, but they do enjoy being loved, just as I do, just as we all do. During the Jesus lifetime, I was surrounded by a loving wife and family who saw me as their own. They loved me for my bright Light, as I loved them for theirs. I was accepted as one who inspired them sometimes, and our mutual respect for one another was the mainstay of our Love. There were many others who made sacrifices equal to mine, including my beloved Mary Magdalene, who was also crucified beside me, in secret. There was no crowd; it would have encouraged the populace to see us as martyrs. There is much still to be told of the Jesus lifetime, and much to be learned of the lifetimes we all have shared since. I appreciate and bow to those who have understood the Christ Consciousness – the truth of Love – God’s Love. Under the name of Christianity, they often hold me in a place above others, and bow to the image of a man on a cross, but I tell you, this is not my truth, and it is not my wish to be worshipped. Then, as now, I am a messenger who speaks for God here on Earth. I did not create a separate religion. I simply spoke of what I knew and felt. I may have spoken more persistently and constantly than some because I feel God’s love intensely, because it was my mission to do so and because I also feel great love for all humanity having been in a human body many times. I now ask those of you who have come to me through Christian teachings and other religious introduction or dogma, to sit beside me as we allow the Christ energy to fill us full to overflowing. The Christ energy does not belong to me; it is a gift from our God. Arm in arm, let’s vow to become even greater vessels for it now. Together, let’s raise our eyes to Heaven, and declare the most basic truth: We are equal, in our Love of God and for each other. I am your Brother and your friend. I invite you to walk with me as an equal, a Master in your own right, and one who knows the great Love of being God’s child, eternally. We are here – together – to create a new world on Earth. I am honored to serve beside you, and to dance in the streets with you as your blessed gift of abundance lifts all boats. Hop in, Friends, this is the moment that will be remembered always as The Beginning! I am your Sananda, the one you have known as Jesus. I love you eternally, my Beloved Brothers and Sisters. The majority of 70 billion non-incarnated human souls were mass evacuated on August 14th, 1999 to the motherships of the Ashtar Command and then transported to a certain planet on the outskirts of the Pleiades star cluster where they started receiving much needed healing.